This beautifully produced book celebrates the work of Robert Adam, the great eighteenth-century architect who influenced generations by stamping his distinctive neoclassical aesthetic vision on the English country house interior. Lavish new photography provides a deeply visual exploration of Adam s most important surviving country houses, to which the author and photographer gained unparalleled access. Included are magnificent country houses such as Syon House and Harewood House styled and inspired by the ideal of the neoclassical as well as Adam s castle-style Mellerstain and town houses such as Home House all captured in splendid detail. Original Adam design drawings, from Sir John Soane s Museum, illustrate the boldness of planning, color, and creative interpretation of Adam s domestic interiors. A biographical and contextual account of Adam s life and work describes his unique design process, his patrons, and the legacy of his design achievement. 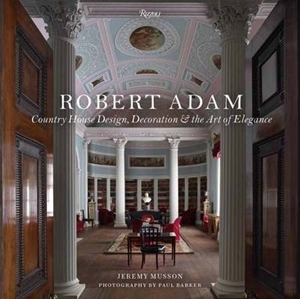 This richly illustrated volume will appeal to designers and homeowners as well as traditional architecture enthusiasts, promising to become an important addition to any architecture and interior design library.